Yeh! We did it! (As Roo would say). 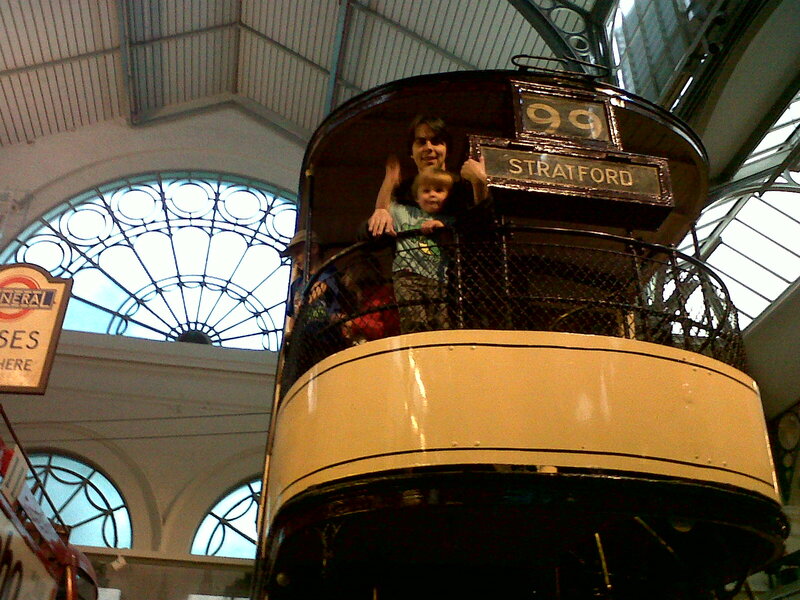 After a looong time of talking about it, we finally got round to going to the London Transport Museum. I was put off by the price for ages (£13.50 per adult) but when someone told me that gave you unlimited access for a year, I figured we’d get our money’s worth. Reuben is very into transport at the moment, in case you hadn’t picked that up already. 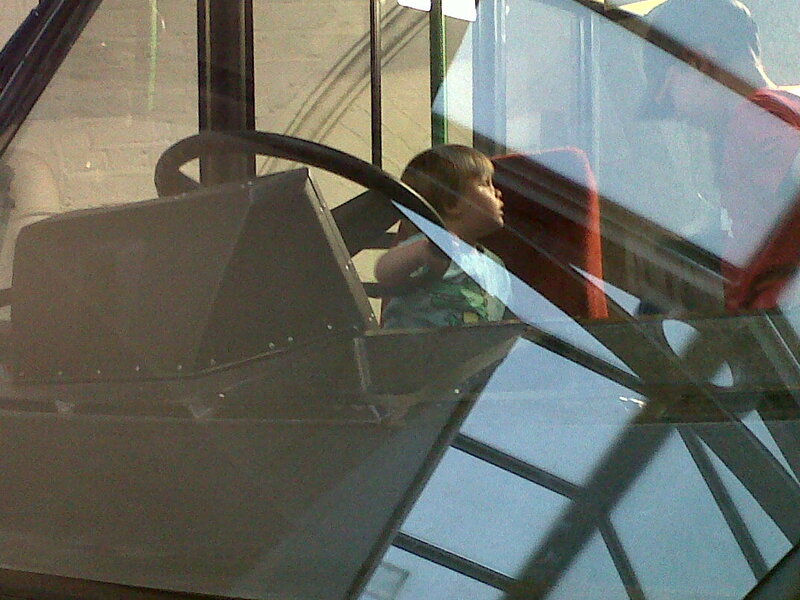 So a place full of trains and buses that he could climb on seemed perfect. And we’d finished church early, had had lunch and he was having a nap so we had time to wander over there. We went in, through the world transport walk and into the lift (in a stroke of genius, the display in the lift didn’t show the floor number but instead counted back from 2011 to 1800) and he woke up as soon as we got out. Perfect timing (well, technically he woke up 209 years before he was born but never mind). He seemed only momentarily confused before running off and climbing onto the carriage and stroking the model horses. The next level down got even more exciting, as carriages made way for choo-chooooos! There’s a slightly frightening toddler-sized gap beneath the trains that Roo didn’t manage to fall into but something to be aware of. Now, if I was the museum-train building type…sorry, not gonna start all that again. Just this word of warning – keep close behind on level one. We ran around that level for a while until we found the first prize of the day – a bus where you could sit in the driver’s seat. Now, I may have mentioned this before but Reuben tried exactly this trick in Coram’s Field, only it was a real minibus, it was full of disabled children and the man who was meant to be in the driver’s seat seemed to be in an “unimpressed by toddler antics mood”. Whoops. Which is why museums like this are a good idea. I think. Or maybe they just encourage him. Hee hee…the look on his face here looks like he’s been caught doing something he shouldn’t have (did he learn that expression at Coram’s?). The shady figures on the right could be undercover policemen, no? Downstairs there were lots more buses to climb on (and some to not climb on but for once this didn’t cause massive issues) and tube trains to run in and out of. There was a mock-up of a tube driver’s cab (with a simulator type thing on a screen in front so you really felt like you were driving!) but that was being rather annoyingly hogged by a random Daddy. To be expected, I guess. One of my favourite things was a corner exhibit of digitally animated London Stuff e.g. a graphic showing the Oyster touch-in and outs over the course of a day. It really was very pretty as well as being interesting. Not sure Roo really appreciated it but me and Nathan did. Roo’s favourite bit was a model trolley bus inside a glass case on the floor that skimmed up and down its track and (at one point) into a tunnel. Not the most exciting sounding thing but it kept him and some older children fascinated for ages. They were all on their knees, crawling along to keep up with it. I didn’t quite see the appeal but don’t knock it if it keeps him quiet. I say quiet, I mean shrieking excitedly but he was being good anyway. On top of all this (you need MORE? ), there’s also an under 6s play area with a fake toddler sized bus, boat and taxi (with comedy punchbag-shaped passengers. What message is that sending out?!). The bus was particularly well thought out, as every seat in it had a steering wheel in front of it. That significantly cut down on a number of toddler punch-ups as they weren’t all fighting over the right to be the driver. Don’t worry, they found other stuff to fight over. Like the table with the wooden version of London on it (quite geographically inaccurate, I have to say. I know a little boy who had a far better one set up). There was a trough cut into it with a train track and train – kinda like a stylised tube I suppose – and there was many a tantrum over that train. Not from Roo, weirdly enough, but from every other toddler there. And also over the spinnable London Eye. Ah, I love 2-years old en masse…. Anyway, there was generally enough to keep them all happy all the time. Shocker, hey? VERDICT: Go there, especially if your toddler is excited by a) trains b) buses (not the ones you have to get on in real life but the kind you can clamber all over) c) tube trains d) all of the above. Don’t be put off by the admission price, just make the most of it and go as often as possible! This entry was posted in Token attempts at culture (museums) and tagged buses, Central London, choo-choo!, museums, rainy day places, trains. Bookmark the permalink.